Detroit, also known as the “The Motor City,” is not only famous for being the world’s automotive center but also for having an extensive system of freeways. The major highways that service the city are Interstate 75, Interstate 96, Interstate 275, and Interstate 94. These large freeways allow you to effectively advertise your business with ample opportunity to do so. Wayne State University and the University of Detroit Mercy have also formed a university district where local advertisers can use outdoor advertisements to reach the college-age audience. 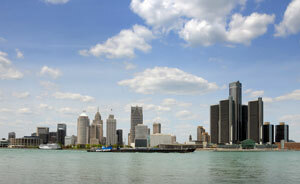 Detroit also has a prominent sports presence with the Detroit Tigers, Detroit Redwings, and Detroit Lions. Each of their respective stadiums such as Comerica Park, home of the Tigers, offer the option for a high traffic digital signage or billboard strategy. Zip Codes: 48201, 48202, 48204, 48205, 48206, 48207, 48208, 48209, 48210, 48211, 48213, 48214, 48215, 48216, 48217, 48219, 48221, 48222, 48223, 48224, 48226, 48227, 48228, 48231, 48232, 48233, 48234, 48235, 48238, 48242, 48243, 48244, 48254, 48255, 48258, 48260, 48264, 48265, 48266, 48267, 48268, 48269, 48272, 48274, 48275, 48277, 48278, 48279, 48288, 48295, 48297, 48299.